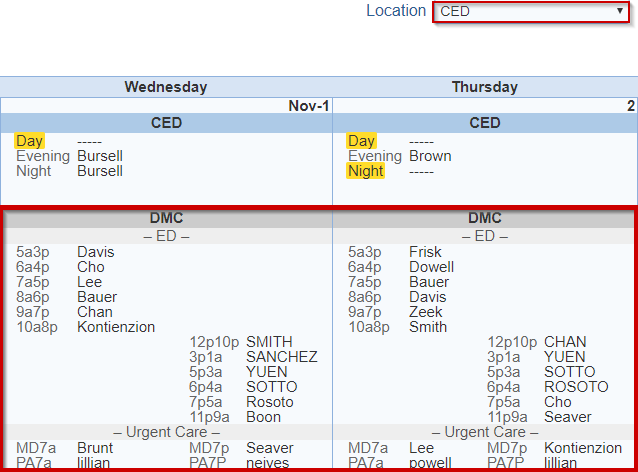 A master schedule shows all scheduled shifts. A calendar view of the up to date schedule. The Master schedule is located in the 'Master' tab and the 'Master Schedule' button can be accessed from the 'Provider portal'. Select any provider to make a schedule change or view a provider's contact information. Hover over the shift for shift assignment details. The number of the day will be highlighted in orange for the current day of the month. You have the ability to confirm hours, propose or certify schedules changes, and edit hours or assignment. 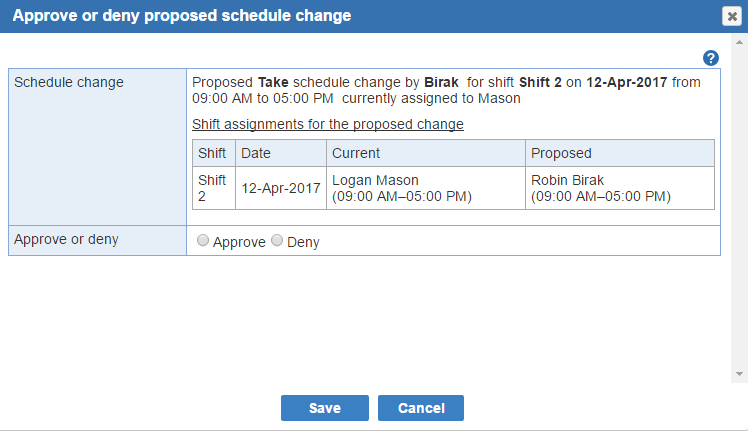 Click on a shift to propose a change in the shift scheduling or, for already worked shifts, to confirm your worked hours. Any shifts that you are scheduled to work are highlighted in green. Any shifts that you have worked, but not yet confirmed are highlighted in pink. To confirm your worked hours for the shift(s), click on each shift and select either 'Confirm hours' or you can confirm multiple shifts at once by selecting the 'Confirm All' button. Any shifts that have been worked and confirmed with their normal shift hours are highlighted in green. Any shifts that have been worked and confirmed with hours edited from their normal shift hours will have the letter 'A' shown next to the shift name. Any shifts that have been worked and confirmed with hours added as pure adjusted hours will have the letter 'A' shown next to the shift name. Any split shifts are indicated by the letter 'S' next to the name of the shift shown in the schedule. To view details of the split, hold the mouse cursor over the name of the displayed shift. Any shifts highlighted in purple indicate shifts that will be rescheduled pending administrative approval. To view the 'proposed change', hold the mouse cursor over the shift. To highlight the shifts scheduled for another provider simultaneously with your own scheduled shifts, select that provider's name from the 2nd drop down menu at the top left of the schedule. Click the 'X' to clear the other provider's name. 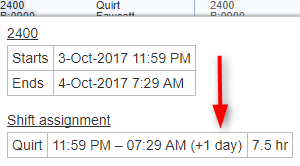 In the shift detail popup in the 'Master', 'Draft', and 'Individual' schedules, times corresponding to either the day before or the day after the start of the shift are indicated as '+1 day' and '-1 day', respectively. 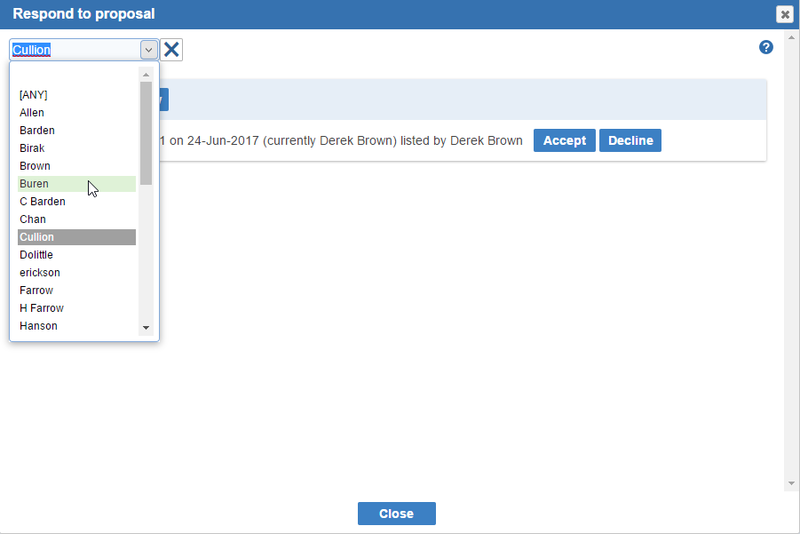 To enter a scheduler comment for a day, select the pencil icon, comments display with a blue background at the bottom of the day. Schedule administrator comments will be viewed by all users viewing the schedule. Individual Schedule: An individualized schedule showing only the shifts assigned to a single scheduled provider. Select Sites: (Optional) A schedule of all, one, or selected sites can be displayed. This option allows the user to select which sites to include when printing 'Master' schedules. This enables you to select which 'Sites' are being displayed in the current schedule. Initially displays all 'Sites'. For large schedules that require scrolling in order to view the entire schedule, you can facilitate review and editing of specific 'Site' schedules by limiting the display only to selected site(s). Both shifts and sites can be hidden or shown in calendars. Confirm All: Any shifts that you have worked but not yet confirmed are highlighted in pink. To confirm your worked hours for the shift(s), you can confirm shift(s) at once by selecting the 'Confirm All' button. Schedule Changes: Shifts that have been rescheduled since this schedule was first published, and for which any provider was involved in the rescheduling, are shown in blue. Move the mouse cursor over the shift to see details of the changes. Scheduler comment: Comments are displayed at the bottom of each day with a blue background. You can see all comments for a day by hovering the mouse cursor over any existing comment. The comment will also be printed on the 'master schedule'. Your scheduler comments are displayed when you are viewing the 'Individual', 'Master', and 'Request' schedules. To add a Scheduler comment: Left click on 'Toggle editing of scheduler comments (CTRL + 1)' button. The Scheduler comment pencil icon at the bottom of the day will display to add a comment. A 'Scheduler comment' window appears containing a text entry area. Type the 'Scheduler comment' for the day. Propose or certify change: This option lets you propose a schedule change. You have the option to choose from 'Propose a schedule change or Certify a schedule change'. (The schedule administrator must have given you permission to certify schedule changes.) The schedule will be changed once; the other involved providers accept the schedule change within the 'My Proposals' screen. (If you require final administrative approval you may need to approve the schedule change before the actual schedule is updated.) 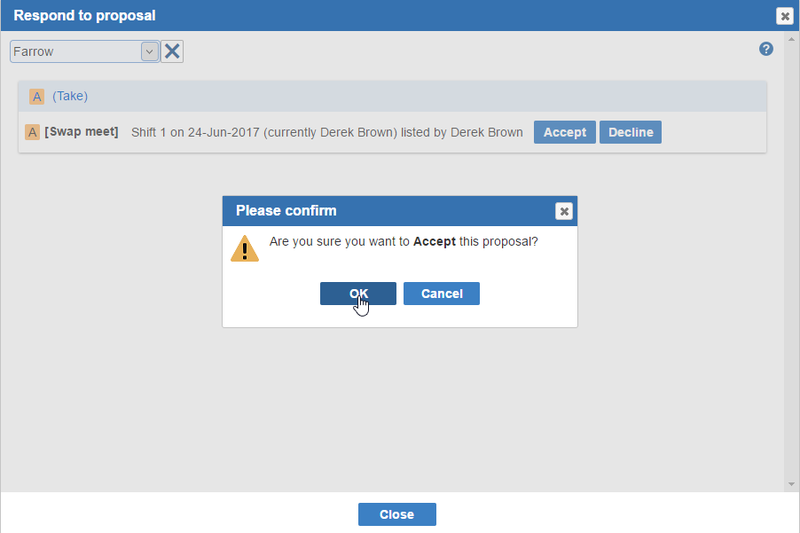 To email your proposal to all or limited individuals: your email proposal is automatically generated, and cannot be edited. 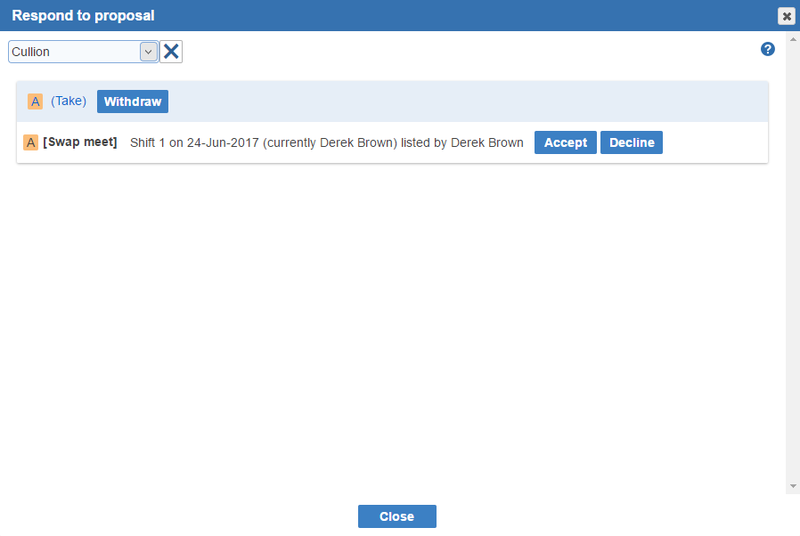 If you wish to add any comments about the 'Certify schedule change or proposal', please enter them in the 'Comment' area. Show provider availability: A list of providers available for a shift can be obtained from the 'Master' schedule tab from a menu item. Show contact: Displays the provider's contact information which includes the phone numbers and email address. Confirm hours: Any shifts that you have worked, but not yet confirmed are displayed with a pink background color. Click on a worked shift to 'Confirm hours' or 'Edit hours or assignment'. Any 'Pure adjustment' hours that you have worked are already confirmed and are listed with the letter 'A'. Click on a 'Pure adjustment' entry to 'Void hour confirmation' or 'Edit hours or assignment'. You can click the 'Confirm All' button to confirm all shifts that have been worked to date. You can then edit the hours of any confirmed shifts that need changes; click on the shift, then select the 'Edit hours or assignment' option. 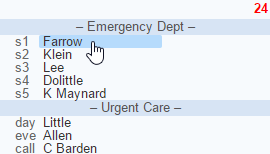 Any split shifts are shown with the letter 'S' next to the shift name. Before confirming your hours, you can view how the hours of the shift are being split by holding your mouse cursor over the shift name; a summary of the split will be displayed. Note: Clicking on shifts that start after the current time will have no effect. Edit hours or assignment: You have the option to adjust the start and end time of a shift and include a reason. Also, you reschedule a provider by clicking the 'Clear' button.If you need to split a shift click the check box next to 'The shift is split' option. Also, you can add a pure adjustment provider to the shift within the 'Pure adjustment provider' section. 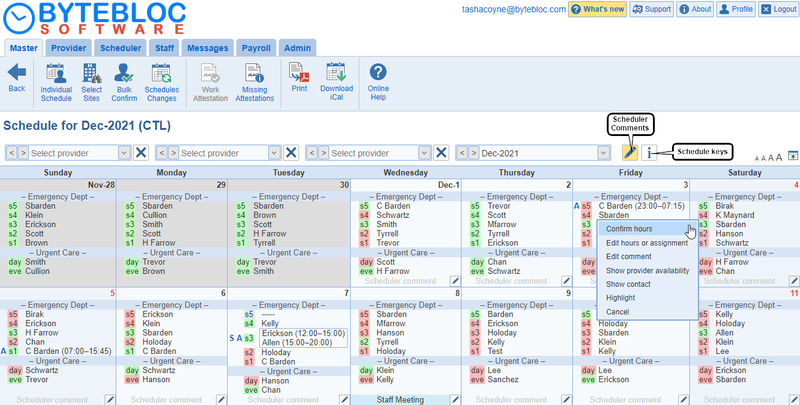 Highlight: In the 'Individual and 'Master' schedules, highlighting is done through the provider popup (from the shift). Highlight applies to 'As-scheduled' and 'As-worked' revisions only. Void hour confirmation: You have the ability to remove confirmation of hours if you needed to adjust a shift or clear by selecting the 'Void hour confirmation' option. Review proposed change: You'll receive a schedule change request email notification and the 'Notifications' reminder will inform you within the 'Provider' and 'Scheduler' portals regarding a proposed change for providers who have the 'Requires Approval' privilege enabled. The shift will be highlighted in purple within the 'Master' tab. 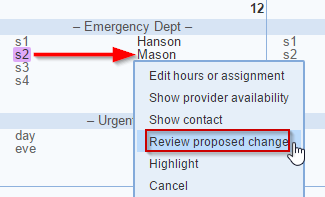 Select the provider's name to choose the 'Review proposed change to approve or deny the schedule change'. Show all providers for split shifts in master schedules: If this option is enabled within the 'Admin' > 'Edit Location' > 'Schedule' tab, all provider names for split shifts will display on the 'Master' schedule. 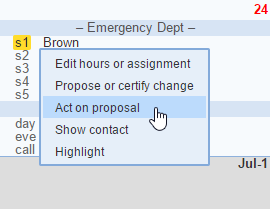 Swap Meet and directed proposals: Highlighted shift color within the 'Master' tab and the menu item 'Act on proposal' allows to respond to proposal directly from the shift. 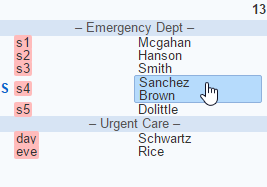 Click on the provider's name and the menu item will display. Now, select 'Act on proposal' to respond directly. Change the menu selector for another provider by selecting their name from the menu. Respond by clicking on 'Accept' or 'Decline' buttons to proceed. Next, select the 'OK' button to update the proposal. 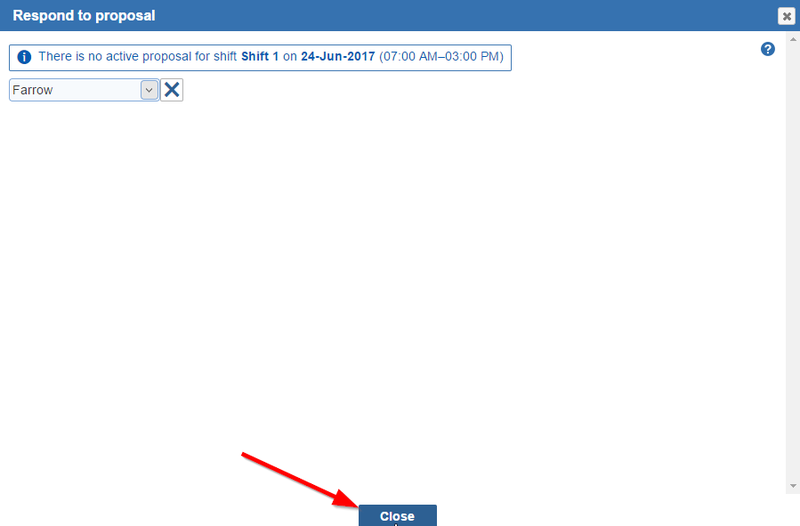 Then, click the 'Close' button to update the proposal. Accepting the proposal will automatically update the schedule with the provider you selected to take the shift. Declining the proposal will leave the proposal highlighted for other providers to respond. Note: Highlighted shift colors will only display if the provider is available to work. Allow view-only privileges for the location to ALL providers at the selected locations: If this option is enabled within 'Admin' > 'Edit Location' > 'Viewing privileges' tab, all providers are granted read only access to the 'Master' schedule of other locations at the current location (i.e., the location that corresponds to the current screen). Inclusion of the 'Master' schedules in a read only manner for related locations is supported even when the start and end dates of the schedules differ across the locations.